For the crust: Preheat the oven to 350 °F. Prepare pizza crust according to package instructions, and set aside while prepping sauce and toppings. For the sauce: In a large bowl, combine all ingredients for the sauce and mix well. For topping: Ladle a scoop of sauce onto the dough and spread out to edges of crust. Top with grated Mozzarella cheese and bake until cheese melts, approximately 10 minutes. Remove pizza from oven and spread teaspoons of cooked chorizo over the top. Add olives. Place back in the oven for 5 minutes. Slice and enjoy! Sauce can be made up to 3 days in advance. We all know pizza is a universally-loved Italian dish. My family especially adores it because I like to make it at home. I know how many pizza joints there are where I could easily go pick one up or have it delivered. The thing is I make it special for my boys. They happen to love chorizo (spicy Mexican sausage), so I prepare chorizo pizza with black olives often. It all started about a year ago when some close friends, Ford and Lacey, gave me a pizza stone as a gift. I remember feeling both intimidated and extremely happy at the thought of making homemade pizza. It actually took me about 6 months before I attempted my first pie. But ever since then, I make pizza on a regular basis. Sometimes with, and other times without the pizza stone. This recipe is easier than most think and a lot of fun to customize. I have vegetarian family members as well as huge meat eaters, so I love the challenge of making super delicious pizzas that will tickle everyone’s fancy. 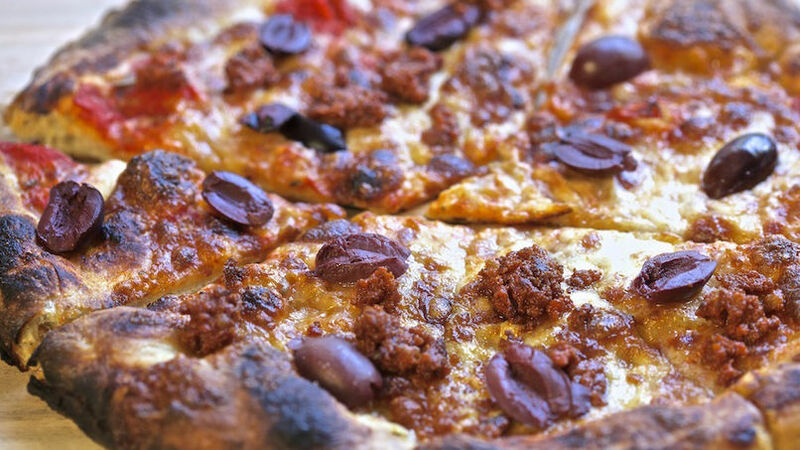 With this chorizo olive pizza, I please the Mexican pork lovers in my brood. I like to invite close friends when I make it, because the taste totally blows everyone away.